EA believes that Crysis 2 won't just be good, it'll be downright excellent. A publisher saying an upcoming game is going to be something special isn't really all that surprising, but David DeMartini, head of EA Partners, is being awfully specific about exactly how special the game is going to be. "A game like Crysis and a team like Crytek's never going to be intimidated by being in any window," he said, referring to the game's earlier Fall 2010 release. "But they will always be very careful of not releasing a game until it reaches its full potential." He said that the game's multiplayer alone had had a whole team - Crytek UK, formerly known as Free Radical, makers of the TimeSplitters games - working on it, and that he thought it would be especially strong. It's a pretty safe bet that DeMartini is right about Crysis 2's review scores; he probably wouldn't have said it if he wasn't sure. As this will be the first time that many gamers will have played a Crysis game, it's good that the experience will be an enjoyable one. 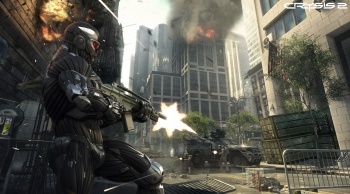 Crysis 2 is scheduled for release on Xbox 360, PS3 and PC on March 22nd next year.